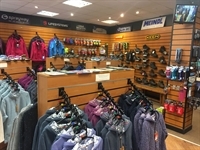 Established in 1992 Track & Trail is an outdoor pursuits business that trades from 2 well located Peak District shops and online, stocking all the best quality brands of clothing, footwear and equipment. The business is strategically located in the Peak Park and benefits from the 22 million visitors each year who come to walk, climb, camp, cycle, sail and fish. As most visitors come to The Peak District to walk in the beautiful countryside the business is focused on this main activity and highly regarded by many loyal returning customers. Over the 26 years of trading a reputation for quality and service has been established, supplying the best products from: Berghaus; Sprayway; Barbour; Meindl; Merrell; Scarpa; Tilley; Salomon;Weird Fish and many more. The business has been run by the same owner for 26 years and now retirement planning creates a unique business opportunity for someone to further develop and expand this retail and online platform. More information available upon request, please contact seller for further details. Leases of differing lengths and rents. Full information available on request. Each of the stores is located in a central prime position within Bakewell & Buxton . The stores have retail trading areas of between 550 and 750 sq. ft. (approx.) with stockrooms and admin areas. Buxton store has first floor storage of 800 sq.ft. (approx.) which acts as a regional stockroom. There is considerable potential to; expand online; develop own brand; add new categories e.g climbing and develop school /DofE business. Other outdoor retailers include Cotswold Camping, Millets, Mountain Warehouse and Joe Royal. Director is willing to remain to ease transfer of business and provide training and general assistance for an agreed period of time.